Working with Jeff Marshall and his team gives me the comfort that he is on top of his game. His approach to my situation seemed to be unbiased and fair for all those involved. The communication with those involved in my case was prompt. My overall experience and satisfaction so far has been positive and I would definitely recommend Marshall & Taylor. After interviewing multiple attorneys to represent me in my divorce case, I selected Marshall & Taylor. Other attorneys I interviewed treated me in a condescending manner, wouldn’t spend time with me, or were giving me incorrect legal advice. Jeff Marshall (of Marshall & Taylor) was a cut above all of them. Jeff was patient, controlled, respectful, organized, efficient, offered correct legal advice, and had a strategy for representing me. He continually counseled me in the things “not to do,” which in the end saved money because it kept me out of court and resolved our settlement in mediation. He kept his cool during mediation and couseled me not to “slam” them back in counter-proposals, but rather to be reasoned in my response. In the end, we achieved a highly favorable outcome from our mediation. From what I have heard, all of the partners at Marshall & Taylor are equally competent. Their hourly rate may be higher than others, but you make it back with their efficiency. In my case, Jeff billed me up front for his services and after the case was concluded did not continue to bill me for one-off questions and “tidy-up” issues related to the final resolution. Jeff also “professionally” received my comments as to how he could have improved his service at key moments during our mediation. Few attorneys can receive professional feedback and not take it personally. Overall, I was extremely pleased with Marshall & Taylor and would use them again. Their reputation in the area is that they are among the best. 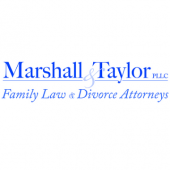 If you are looking to be treated respectfully and represented competently, Marshall & Taylor is an excellent choice. He is a very great professional business man and handles thing wonderful would recommend him highly to anyone. I have been utilizing the services of Jeff Marshall in my pending divorce. I felt that I have been treated with the utmost respect, his knowledge and thought process with regards to my separation and divorce have been thorough and extremely helpful. Although I retained Jeff’s services to complete the legalities of my divorce, he has been an invaluable resource of information for issues that have come up during my separation, and has been my advocate during a difficult period of time. His knowledge of the divorce process and of ‘thinking outside the box’ are impressive. I would (and hopefully do not ever have to) use his services again…I highly recommend him. Jeff Marshall did a great job working on my case. He always took the time to talk with me or at least email me back in a timely manner.I will use him again if ever needed. I recommend Jeff Marshall highly. He combines deep insight and passion with a thorough knowledge of family law. Jeff demonstrates a keen interest in every client’s case he is handling. I would always receive timely updates on my case from him, wise advise and friendly support. He is very loyal and honest person and highly professional lawyer who is doing his very best to help you out to win the case and reach the most desirable resolution. At very short notice I hired Jeff Marshall to represent me and he provided an exceptional service with a great result. He drafted a very fair separation agreement, dealt with the divorce and later helped me get custody of my kids. Hopefully I will never be in this situation again but if I was I would definitely hire Jeff. Jeff Marshall took over my case after I had come to dismiss another firm. The difference in what can only be termed ‘customer service’ & personal attention I recieved was incredible. What had dragged on for months at another firm was settled quickly & efficiently by the staff at Marshall & Taylor. Calls & emails were promplty returned, a detailed statment was provided monthly. I was kept in the loop of each & every development in my case. I highly recommend this firm. At a time when so much is out of order, their attention to detail & knowledge of the law & the process reduced some of the angst associated with this time of upheaval.